In this post, we examined 5 of the best-selling rust removers. Rust cleaners contain phosphoric acid and oxalic acid to remove corrosion and rust stains. These acids counteract the chemical reaction that causes metals to rust (Source). Rust (also known as iron oxide) is a chemical reaction that happens when oxygen and iron mix. Most modern rust elimination products change the molecular structure of the rust through a chemical reaction. Phosphoric acid changes the iron oxide to iron phosphate, which is a weaker acid (Source). While chemical products are ideal for getting rid of rust, when it becomes a chronic problem, many experts recommend using tools to grind, sand, or scour rust off the metal. If using chemicals, they advise you wear protective eye and hand coverings and that you plan on applying multiple coats for stubborn rust problems (Source). Here, we look at five products designed to get rid of rust and stains. WD-40 is an old standby ‘rust eater’ found in practically every garage in America. This one-gallon “Specialist” product dissolves rust and restores metal parts. This industrial strength product is effective and non-toxic, and safely gets rid of rust without acids or caustic chemicals that can burn you. This product is ideal for use in auto restoration and in applications where you don’t want to do a lot of scraping. Whink makes a solution that’s formulated to deal with rust and stains associated with rust as opposed to being an outright rust removal aid. The bottle we looked at is the 32 ounce, and it quickly gets rid of rust and stains around sinks and toilet bowls. This product is made in the USA, and users praised it for how fast it dealt with rust stains, especially on white sinks and toilet bowls. 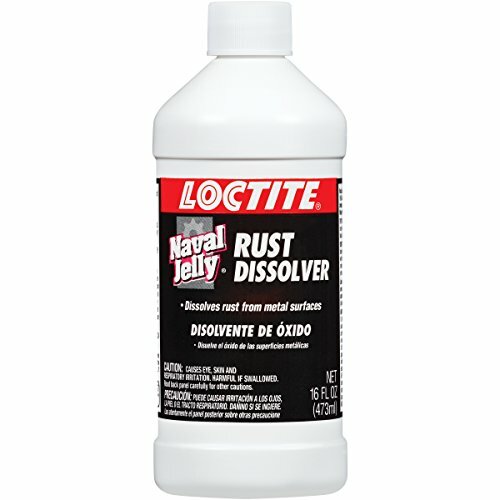 Loctite Naval Jelly Dissolver is a high-strength solution that dissolves rust from metal surfaces, such as cars and patio furniture. This product has been around for decades and is the go-to solution for many people who need something strong to deal with heavily rusted items. Although it’s a powerful product, users say the best results came from applying more than a thin film as the bottle suggests. Evapor-Rust is billed as a super-safe rust removal product. This non-toxic formula is odorless, won’t irritate your skin, and is biodegradable. This water-based remover is one of the highest rated products we looked at. Consumers found it exceeded their expectations time and again at dealing with the most stubborn rust buildup. 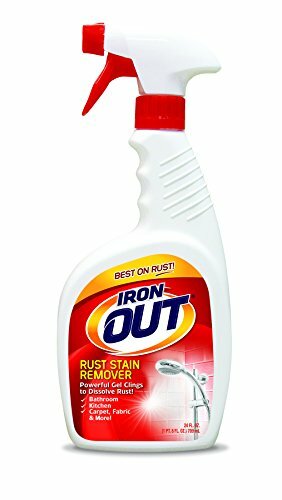 The last product we looked at is the Iron Out stain remover. This 16-ounce spray gel is made in the USA and is ideal for getting rid of those stubborn rust stains without the need for scrubbing or sanding. The gel helps it cling to the surface, which makes it more effective, and makes it perfect for getting to those hard to reach places. Users rated this product highly, and some even said it’s useful for laundry applications when one has water with high iron content. This rust removing spray offered by Summit Brands is efficient, affordable, non-toxic, and an excellent choice for bathrooms. Users love the price and the efficiency of the product, but some do note that it has an awful smell. The Summit Brands iron stain remover features a unique multi-purpose liquid formula, which clings to dissolve the stains without scrubbing, and it’s ideal for areas with hard water and high iron content. Another excellent thing about this product is that it’s non-abrasive, non-hydrofluoric acid based so that it’s safe to use. What’s more, it’s made in the USA. As a whole, purchasers have a high opinion of the Summit Brand rust spray, and they highly recommend it as one of the best rust removers available. A user comments that the spray works far better than she ever hoped for and that the stains disappeared with 2-3 applications. Another buyer states that a few spritzes and the ugly rusty spots dissolved before her eyes without spending hours scrubbing them away. She warns that the product does smell awful, but nothing can compare to its efficacy. A reviewer also shares that she is going to buy another pack and that cleaning the bathroom doesn’t take ages anymore. However, a couple of customers have noted that it takes a lot of the spray to do the job and that it doesn’t work as quickly or efficiently as they expected. 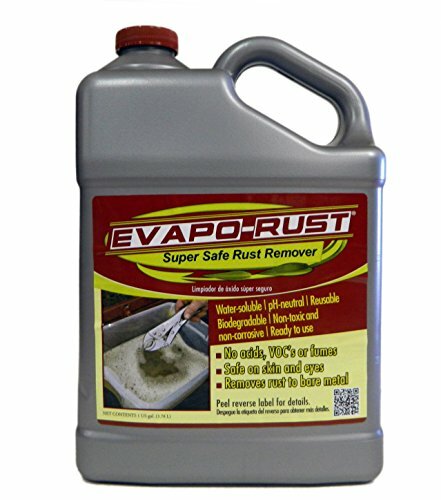 If you’re looking for a way to get rid of those ugly iron stains in your bathtub without worrying about dangerous chemicals, you can take a look at this rust remover offered by Evapo-Rust. Users love the price and the size of the bottle, but some do note that it’s not as efficient as they expected. The Evapo-Rust features a non-toxic formula, which doesn’t contain acids or produces toxic fumes, and it’s safe to use in the house. Another great thing about this product is that it’s not dangerous upon skin contact, and it’s biodegradable. The product is available in a bottle of one gallon. A reviewer comments that he used the iron remover on rusted bike wheels and that after soaking it dissolved completely with minimum scrubbing. He adds that he is amazed by the results and that he highly recommends the Evapo remover. Another user says that the liquid practically eats the rusty spots away and that it has never disappointed him so far. A purchaser also remarks that he used it to clean his instruments and nothing can beat its quality or speed. However, a couple of customers have complained that you have to soak the rusty object in the liquid for it to be effective. As a result, it’s only useful for small objects. Some also point out that they didn’t see any improvement after applying the remover. This rust dissolver offered by Henkel is easy to use, effective, and available in bottles of 16 ounces and 8 ounces. Users love that the product works fast, but some do note that they are not happy with the achieved results. The Henkel jelly iron remover features a special formula designed to deal even with heavily rusted items and can be either applied with a brush or sprayed. Another great thing about the Naval Jelly is that it’s simple to use – you just have to clean the object, apply the jelly, and rinse. However, be careful because it might cause skin, eye, or respiratory irritation – use gloves and a mask. A reviewer comments that he didn’t think the Loctite jelly was up to the job of removing the stains from his old car, but it worked like a charm. He adds that he highly recommends it as one of the best rust removers available. Another user shares that he applied the gel with a painting brush to a heavily rusted printing press and that after three applications it looked as good as new. A purchaser also comments that you’ll hardly find a better iron dissolver than Loctite even though it doesn’t smell nice. He also says that you need to leave in on for no more than 10 minutes to do the job. However, a couple of customers have complained that the naval jelly is not as efficient as they expected even with multiple applications. This iron stain remover offered by Whink is durable, easy to apply, and an excellent choice for white sinks and toilet bowls. Users love the efficacy of the product, but some do note that it’s too expensive. The Whink remover features a specially designed formula to dissolve stains quickly and easily, and it comes in a 32-ounce bottle. Another great thing about this product is that it’s made in the USA, and it’s useful for colorfast fabrics and carpets. In addition to this, it won’t damage your pipe, so it’s safe for the septic system. However, keep in mind that it’s acid-based and should be applied according to the instructions. A buyer shares that she bought Whink to remove stubborn hard water stains in the toilet after several similar products have failed. She says that it worked perfectly and she almost didn’t have to scrub the stains. Another reviewer mentions that you don’t need to pour a lot of the liquid to do the job, so the bottle is going to last. A user also observes that the Whink dissolver melts the rusty color on contact and that you’ll hardly find something better for stubborn rusty spots. However, a couple of customers have complained that the product didn’t live up to their expectations and that they didn’t see any positive results even when following the instructions to the letter. 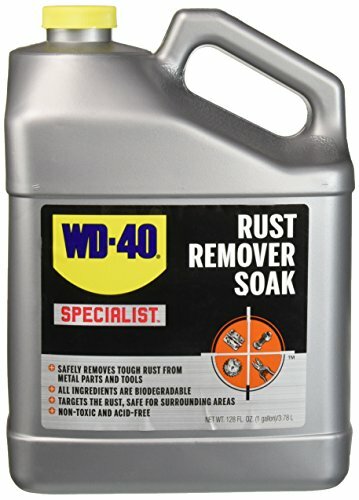 If you are looking for the best rust remover for hard water stains, you might take a look at this one offered by WD-40. Users love that it’s non-toxic, but some do note that they expected better results. The WD-40 specialist remover features biodegradable ingredients, which will deal with the stains without the need for acids or caustic chemicals. Another great thing about this product is that WD-40 has had over 65 years to perfect their formula and their products have industrial-strength quality and extreme penetration abilities to dissolve even the hardest spots. What’s more, this product is perfect for tractors, antiques, trailers, and rusty tools, of course. As a whole, users have a high opinion of the WD-40 brand, and they highly recommend it as one of the best rust removers on the market. A buyer comments that he has used the dissolver on several occasions and that he has never had any problems with it. He adds that it works fast and it will remove even 10-year-old rust. Another purchaser states that he was amazed by the results and that it’s perfect for tools. He recommends that you leave the solution overnight for optimum results. However, a couple of customers have complained that the dissolver works well only on surface rust and that it’s not efficient at all. How to remove rust stains from clothing and washable fabrics: if you have rust on garments it may be taken out with either white vinegar or by using lemon juice. Place the clothing or fabric on a well-used towel and put a tiny bit of white vinegar right on the stain- or apply a cut lemon half on the blemish. Bathe it completely, after that blot it with a nice and clean white-colored hand towel. Place it outside in sunlight until the stain begins to fade, after that wash as usual. More substantial or obstinate stains really benefit from a serving of commercial rust remover, available at hardware shops like Home Depot. Over on Reddit, inside of their You Should Know forum, one user suggested that an inexpensive way to remove rust from rusted objects, even clothes, is to dip it into vinegar. They say that this is an easy, DIY hack – all you have to do is submerge it in undiluted vinegar for one or two days. 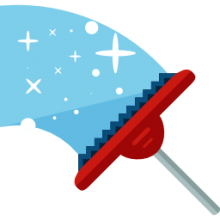 Then you can remove it, wipe it down with a rag – + in his case, he was able to remove rust from his hardware tools pretty easily. Another person said that they have used this method for restoring cast iron and for clothes. Although, in his experience, he says it only takes a couple of hours to work. Another person wondered what the exact concentration was when it comes to dilution. The original poster responded and said that in his case he is just using household white vinegar, that’s been effective as is You should be careful, he advises, not to dilute store-bought vinegar with water and expect positive results. You’ll know if it’s working within a couple of hours when you begin to witness the vinegar browning and rust flaking from the surface of the item. Over in the Metal Working forum, one user said that he had purchased an antique barber chair that he was doing a total restoration on. He was looking for a way to remove a surface coating of rust from chrome surfaces without destroying the metal. One user suggested employing naval jelly and lemon juice. Another suggestion was to use a Scotch-Brite pad and even getting some sandblasting done. Another user popped up in the comment saying that he was looking for a way to de-rust an antique anvil. The original poster said that he’s leaning against doing electrolysis and might want to try sanding, but was looking for something less labor-intensive to start. A metal worker advised that a grinder’s wire wheel might damage the chrome, so it might make sense to purchase a jug of distilled vinegar and try soaking pieces at a time to start. Another user suggested phosphoric etch. He says that it will help you convert iron oxide into iron phosphate. Or you can use sodium bisulfite, which is a common pool chemical that will probably be able to eradicate rust without damaging the steel. Over in another section of Reddit, one of the top recommendations was for a product called Evapo-Rust. Users said that they’re unable to find it available for purchase in Europe. One person said that if you visit an auto parts store in America you can find it pretty easily- he said that he purchased a gallon of it at O’Reilly’s, Walmart, Home Depot or Target and even found some for sale on eBay. Other users said that it was better than vinegar, being less corrosive and harsh. Indeed, some metal workers said that if you’re doing a lot of restoration work it is a solid investment because it is non-toxic, biodegradable and generally considered safe. Over in the Life Pro Tips section of Reddit, one person suggested a pro tip that you can eliminate rust by rubbing it with aluminum foil that has been soaked in vinegar. And his case, he used the method on an old bicycle and it almost immediately removed all of the rust. One of the top bits of advice was provided by a user who said that whenever you’ve employed an aggressive method like this, you’ll want to ensure that you washed off all of the acidic solvents after and then gone ahead and protected the new metal with a clear coat or with some paint so that it doesn’t just rust again. If the idea of soaking aluminum foil sounds somewhat oxymoronic, one user suggested the following process. The way he did it was by using a shallow plate, filling it with vinegar, and then just dipping the aluminum foil into it. He says it obviously the vinegar isn’t going to be absorbed by the foil but enough we’ll stick to it that you can use it on the intended surface.